Medellín’s rebirth is nothing short of astonishing. But have the drug lords really been vanquished? Fifteen years ago, a single mother named Libia Gomez converted part of her modest cinder-block house into a shop selling sundries ranging from pencils to toothpaste. The location was hardly ideal. Gomez lived in Santo Domingo Savio, a onetime squatter community on a steep, forested slope overlooking the Colombian city of Medellín that had evolved into a permanent slum. Santo Domingo had grown so violent that even the police would not dare to enter. Gomez could see Medellín’s city center, a mere two miles to the south, from Santo Domingo, but getting there safely was nearly impossible because traveling down the hill into town would have required crossing multiple zones controlled by rival armed groups. The rest of the city was not much better: Several years after Pablo Escobar, kingpin of the Medellín cocaine cartel, had been gunned down by police while fleeing across the rooftops of the middle-class barrio Los Olivos, Medellín remained the world’s most violent city. In 1991 Medellín had an astronomical 381 homicides per 100,000 residents (Ciudad Juárez was only half that last year). But today Medellín has, incredibly, become as safe as Washington. 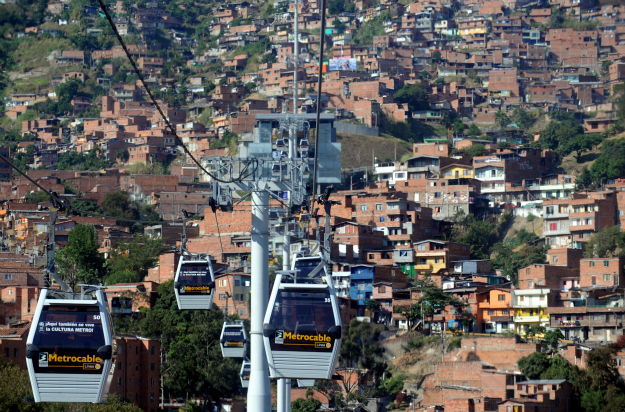 Today, Gomez is able to look down on the once impassable route from aboard the Metrocable, a ski-resort-style gondola system that carries residents of Santo Domingo high over the cityscape of red-brick buildings to the metro linking them to the rest of Medellín. Her shop sits in the shadow of the Parque Biblioteca España, an ultramodern library complex that presides over the city like the Spanish citadels of 500 years ago. The surrounding community has become one of the city’s most popular tourist draws. "In the old days, my son would be afraid to walk to school. Now he walks freely," Gomez told us. This is the sort of story people offer when they talk about the "Miracle of Medellín." In 1991, the city had an astronomical 381 homicides per 100,000 residents (by contrast, the murder rate in Ciudad Juárez, the bloody epicenter of Mexico’s drug war, was only half that last year). But today Medellín has, incredibly, become as safe as Washington. Medellín’s reinvention holds potentially important lessons not only for the drug war in Mexico, but also for everyone else. Over the past generation, Americans have grown cynical about grand experiments in urban planning and other sweeping social-policy programs. But for most of the world’s population, consumed with the necessities of day-to-day existence, getting social services right matters a lot more than ideology, as populist autocrats like Hugo Chávez and Islamist groups like Hamas and Hezbollah have figured out. Think government can’t deliver smart, intelligent urban design that changes lives? Travel to Medellín, and it’s hard to remember why it is that Americans have given up trying. From the outset, Medellín had one big thing going against it: It was in Colombia. Over a 10-year period in the middle of the 20th century known as La Violencia, the country’s two main political parties engaged in a brutal civil war that claimed 200,000 lives. The warring factions brokered a power-sharing deal in 1958, but peace was only temporary; the pact excluded other political movements — most notably the leftist Fuerzas Armadas Revolucionarias de Colombia (FARC) — which took to the jungles and began a still-ongoing guerrilla war against the Colombian state. The war was enabled, and prolonged, by the traditional weakness of Colombia’s national government, which operated only a small army and national police. Members of the country’s traditional elite liked things this way, preferring to protect themselves by arming local paramilitaries. Over time, the paramilitaries grew in size, power, and independence and, like the leftist groups, began trafficking in drugs to support themselves. As peasants fleeing the violence in the countryside sought refuge in Medellín, the city’s population exploded, growing from 350,000 in 1951 to 1.5 million in 1985 — an influx the city was in no condition to absorb. The new inhabitants colonized the hillsides and created insular communities, like Santo Domingo, in which the state had no presence at all. By the early 2000s, so many people were being kidnapped and held for ransom by the FARC that a weekly radio show, Las Voces del Secuestro, was established to allow their relatives to broadcast messages to them. These conditions were exacerbated by the rise of the drug trade in the late 1970s, driven by demand for cocaine in the United States. But Medellín’s problems didn’t end with the fall of Escobar and the dismantling of the Medellín cartel in 1993; other drug cartels, guerrilla groups, and paramilitaries stepped in. By the early 2000s, so many people were being kidnapped and held for ransom by the FARC that a weekly radio show, Las Voces del Secuestro, was established to allow their relatives to broadcast messages to them. Things began to change with the election of Álvaro Uribe as president of Colombia in 2002. Pledging “Democratic Security,” Uribe dramatically expanded Colombia’s military and national police and launched an all-out offensive against the FARC. Doing so rewrote the basic Colombian social contract: Henceforth, it would be the state and not private militias that provided security to Colombian citizens. The president negotiated an agreement with the largest paramilitary organization, the Autodefensas Unidas de Colombia; the group’s fighters were required to lay down their weapons and abide by Colombia’s anti-drug laws in exchange for pardons. But the demobilization has been severely criticized by observers both inside and outside Colombia. Human Rights Watch’s Maria McFarland, a longtime Colombia observer, argues that the policy was too lenient on the paramilitaries and unenthusiastically enforced; many within the Colombian elite, she and other critics have charged, could not afford to push the judicial process too far for fear of exposing their own ties to the militias. Nevertheless, between 2002 and 2003 Medellín’s homicide rate fell 46 percent, and it kept falling until 2007. It would take a political revolution, however, to turn the ideas into a real-world policy agenda. This revolution was led by a newcomer to politics: Sergio Fajardo, a professor with a Ph.D. in mathematics from the University of Wisconsin who became mayor in 2004, boosted by an unorthodox coalition of business people, grassroots community organizers, and the middle class. Telegenic with his trademark blue jeans, open shirt, and curly locks, Fajardo began writing a regular column in the 1990s for the Medellín newspaper El Mundo about local politics. “We realized,” Fajardo told us, “that politicians are the ones who make important decisions in society whether we like it or not, so we said to ourselves that we have to get into politics. Instead of saying how things should be, we said this is the way it is done.” In Fajardo’s view, Medellín had two fundamental, and related, problems: extreme inequality and a culture of violence. Fajardo believed that policies aimed at repairing the city’s damaged social fabric could alleviate both. Fajardo: Medellín had two fundamental, and related, problems: extreme inequality and a culture of violence. Repairing the city’s damaged social fabric could alleviate both. When you go to the poorest neighborhood and build the city’s most beautiful building, that gives a sense of dignity. The most striking feature of Fajardo’s approach was his plan to erect high-quality public architecture in Medellín’s poorest neighborhoods. “Architecture sends an important political message,” he says. “When you go to the poorest neighborhood and build the city’s most beautiful building, that gives a sense of dignity.” Fajardo and his colleagues believed in social urbanism: the idea that modernist buildings and transportation systems of the sort Libia Gomez now enjoys would help bridge the enormous gulf of distrust separating the poor from mainstream society. In barrios like Santo Domingo and Comuna 13, the city created digitized maps of every street and building, noting where drug gangs operated and money flowed, and devised architectural features to disrupt them. Fajardo also needed to deal with the thousands of demobilized fighters who had never interacted with normal society without a gun in their hands. This was no small task; many had lived in a world of violence and criminality for most of their adult lives. More than 70 percent of them were functionally illiterate, and few had employable skills. Unsurprisingly, the success of the reintegration programs Fajardo’s administration launched has not been unequivocal. Human Rights Watch claims that many of the more than 30,000 officially “demobilized” in the country were not even active combatants, but, rather, poor individuals seeking generous social programs. In Medellín, 16 percent of the more than 5,000 participants have been expelled, arrested, or killed, and the temptation to relapse is unlikely to go away as long as jobs are few and wages are low. Still, Medellín’s failure rate is lower than most other demobilization efforts in Africa and Asia — and the cartels have not returned, at least not in force. Of course, these new social programs cost a tremendous amount of money. The renovation of Comuna 13 alone, a barrio of 135,000 inhabitants, cost $155 million over a three-year period. Total spending by Medellín’s city government doubled between 2004 and 2008. But two sources of funding in particular have made the gargantuan expense of rebuilding Medellín affordable: Medellín’s city-owned utility company, Empresas Públicas de Medellín, which is well run and profitable, and a high municipal tax rate that is tolerated by a uniquely civic-minded business elite. Many in this group refused to flee to Miami even at the height of the violence and have come to believe that a safer city is worth the extra cost. “We had a responsibility to our own family, the business, and the city,” says Juan Luis Restrepo, the American-educated owner of a Medellín-based textile company. Can Medellín’s example help save Mexico? Yes and no. Because of Colombia’s centralized system of government, Uribe was able to professionalize and expand law enforcement from Bogotá; federally organized Mexico’s huge problem with police corruption, a major barrier to winning the drug war, lies primarily at the local level, beyond the constitutional reach of authorities in Mexico City. Can Medellín’s example help save Mexico? Yes and no. That said, there are useful lessons Mexico can draw from the Medellín miracle. Like Colombia in the 1990s, Mexico is vastly underpoliced and has a weak judiciary, problems that can be solved in time with sufficient resources and will. But Colombia’s drug war shows that the battle will not be won by military force alone. The government needs to bolster its legitimacy by offering people alternatives to crime and violence, as well as a renewed commitment to public services — something Medellín’s metro, its starkly beautiful new buildings, and civilized public spaces now do. The recent uptick in violence was the result of the extradition to the United States of former paramilitary leader turned crime boss Don Berna. His absence created a power vacuum and it prompted a violent scramble for power among lower-ranking lieutenants. The harder lesson here, however, is that there are no quick fixes in a drug war, and two steps forward are often followed by one step back. After bottoming out in 2007, Medellín’s homicide rate has since doubled (though it is still one-fifth of what it was at the city’s early-1990s nadir). Nearly everyone in the city agrees that the uptick in violence was the result of the Colombian government’s 2008 decision to extradite to the United States former paramilitary leader turned crime boss Diego Murillo Bejarano, locally known as Don Berna. What that meant, in effect, was that the critics had been correct: The Colombian government hadn’t actually successfully demobilized the drug-trafficking paramilitaries. Instead, by seriously crippling the competing guerrillas, the government had given a monopoly to Don Berna. It was peace achieved through market dominance, not demilitarization — and when Don Berna’s extradition decapitated his organization and prompted a violent scramble for power among lower-ranking lieutenants, the peace fell apart. But still, the chances that Colombia will return to the lawlessness of the 1990s are slim. This is the long and arduous path that Mexico has embarked on under President Felipe Calderón. It will not win the drug war anytime soon, but with sufficient political will, it can at least start moving in that direction. via Half a Miracle – By Francis Fukuyama and Seth Colby | Foreign Policy.